The importance of selfhood to our everyday life, how it relates to emotional and mental wellbeing and psychiatric diagnoses, and how to recover our sense of self. The book is also available through bookshops worldwide. Any bookshop that does not have the book in stock can order it for you. If you would like to order a copy directly from Terry, or if you would like copy signed by Terry, please email him at info@doctorterrylynch.com. Selfhood: A Key to the Recovery of Emotional Wellbeing, Mental Health and the Prevention of Mental Health Problems is a practical self-help book, designed to help people to recover their sense of self, be happier and more fulfilled. Readers will learn a great deal about themselves, others and life. Dr. Terry Lynch has found that a reduced sense of self is a recurring characteristic of people experiencing considerable anxiety, depression, bipolar disorder, schizophrenia, obsessive-conpulsive disorder (OCD), eating disorders and borberline personality disorders. Reduced selfhood is often a defence mechanism, designed to keep us from taking risks that might overwhelm us emotionally. Readers will discover what selfhood means, how closely selfhood is linked to emotional and mental wellbeing and mental illness, the components of selfhood, how selfhood is lost, the feature of low and high selfhood, and how to reclaim one’s sense of selfhood. Selfhood contains many practical suggests and recommended actions, devised to enhance people’s sense of self. It is simply not possible to feel good, to regularly experience emotional wellbeing and mental health if your level of selfhood is low. “Well written, in layman’s terms and strongly recommended”. “Over the last few years I read many books on Self Esteem and Psychology . . . I was still looking for the ‘root cause’ of the emotional distresses in life . . . the missing link, so to speak. I wondered what that could be and the word “Selfhood” came to mind one day. I googled it, found this book and ordered it to be delivered here in Australia where I live. This book has brought real, meaningful and profound changes in my life. Reading this book was like finding myself, like a journey back home. This book has put me in touch with my own ‘place of power’, my place in this world from where I can perceive and deal with it effectively and know that my perspective is as valid as others. The book explains why we sometimes try to read minds of other people and speculate their intentions and how disempowering and futile it is. Instead, the book teaches us on how to remain on our side of the tennis court. This is a much better way to live. Lynch belongs to that new trend, still he is unique. By coining the term Selfhood, making it a simple workable model Lynch introduces a completely new approach for the treatment of those with mental/emotional problems . . .
“I put my service users hat on to read this book and found it to be the best delivered service users book by a long shot. It was easy to read and understand. I would recommend this book to every mother I work with (I work with mothers in depression and addiction). It is full of helpful tips and support and its easy to navigate around. 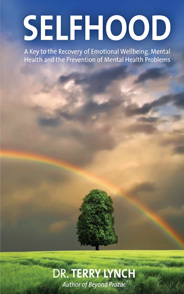 “Terry Lynch’s book explains and reveals in a very straightforward way how a low sense of selfhood accompanies emotional distress and other more serious mental health issues. The issues are well explained and the approach to understanding and enhancing your sense of selfhood is clear and practical. The book is written in a positive and encouraging tone, but doesn’t shy away from the real issues or the work which is proposed. In this sense Terry writes like a good friend who is not afraid to give you frank advice! There is a lot in this book which I have found revealing and initially surprising. In particular the section and advice regarding personal space and the boundary strikes me as particularly strong and relevant. Having read the whole book once already, I have already found such sections very useful and will continue working with the book.